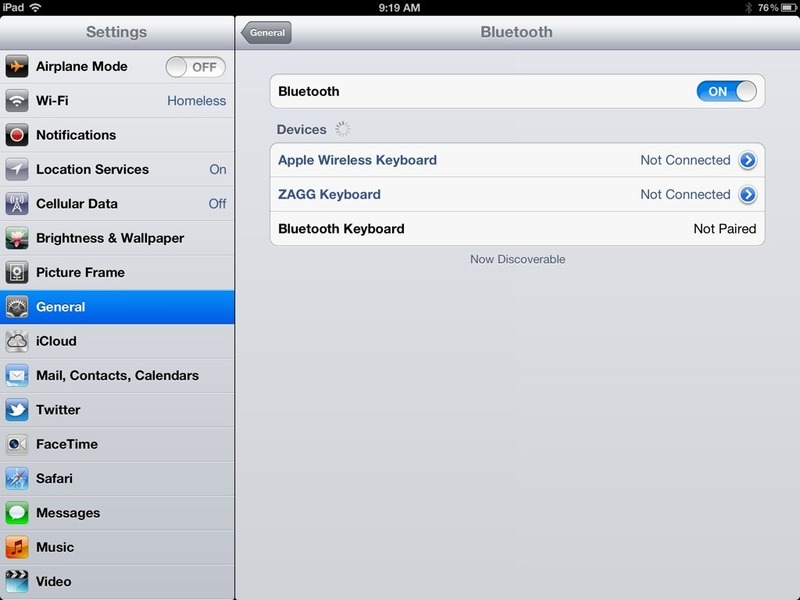 Here’s a quick tip that may help if you’re having trouble getting a Bluetooth keyboard to pair up with your iPad. 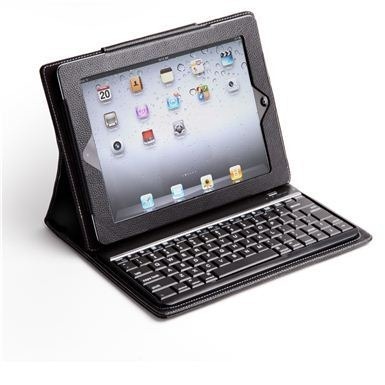 I was trying to pair up a Bluetooth keyboard + folio case from eKit this morning and found that it just wasn’t being seen at all when I turned on Bluetooth on the iPad. 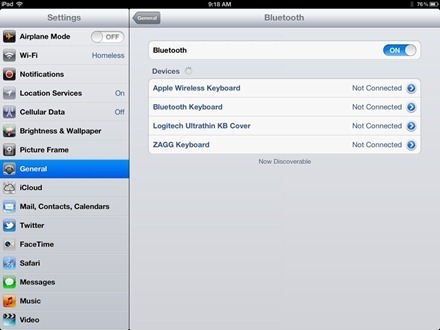 The keyboard was powered on and in connect mode, Bluetooth was turned on in Settings on the iPad, and the iPad listed a ZAGG BT keyboard and others it had previously been paired with – but it didn’t discover any new devices. I tried turning the keyboard’s power off and back on a few times, followed by turning Bluetooth on the iPad off and back on – but the keyboard still wasn’t discovered by the iPad. There was one just listed as ‘Bluetooth Keyboard’ which I had tried tapping on a couple times and it told me the device was not available and to check its power status etc. The it occurred to me that perhaps the eKit keyboard was announcing itself with the same generic ‘Bluetooth Keyboard’ name. 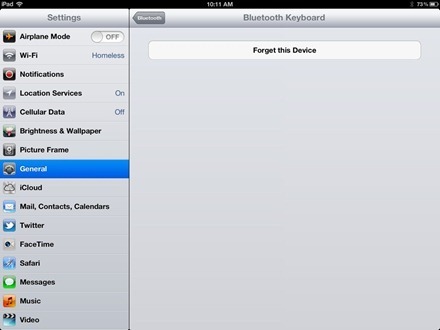 So I tapped the blue arrow at the right hand side of the existing entry for Bluetooth Keyboard and then tapped to Forget This Device and clicked OK to confirm I wanted to forget it. And sure enough that did the trick. When I turned Bluetooth off and back on again on the iPad and powered the keyboard off and back on, it showed up as Bluetooth Keyboard and Not Paired, just as it should, and paired successfully with the iPad. I guess the moral of the story is it would be helpful if BT keyboard makers would be sure to give their devices less generic names. My ipad 4 screen looks very different when I click on settings and general. Bluetooth doesn’t show and when I scroll to the box with date & time, keyboard, international & accessibility nothing shows like your screen. Anyway I still can’t the Zagg bluetooth keyboard to work. In fact I can’t even get ipad’s keyboard up. thanks a lot . It was really helpful. Thank you so much for this solution to my same issue. This worked for me as I was becoming a little frustrated.